Once upon a time, I lived in a bucolic city called Chuncheon (choon-chun)…. Nestled in rugged, snow-peaked mountains of South Korea, Chuncheon is about 45 miles northeast of Seoul. It’s considered Korea’s lake country and acts as a haven and perfect getaway for weary city slickers wanting to escape Seoul’s urban jungle. For me, it was a great place to live—mountains, lakes and rivers—the scenery was beautiful. Living in Korea was so fascinating—the language, the people, the culture, the food, the sites, the smells…were all so captivating. Like a sponge in water I soaked it all in, learning as much as I could during my short year there. I made new friends and learned some Korean while my taste buds were seduced by the country’s vivacious culinary scene. Colorful, spicy and intoxicating, Korean food is an explosion of flavors, textures and heritage. From colorful and aromatic foods sold on the street to world-class cuisine, Korean food is often a feast for the eyes and palate—a dream come true for many foodies. My favorite dish while living in Korea was dolsot bibimbap, South Korea’s quintessential comfort food. 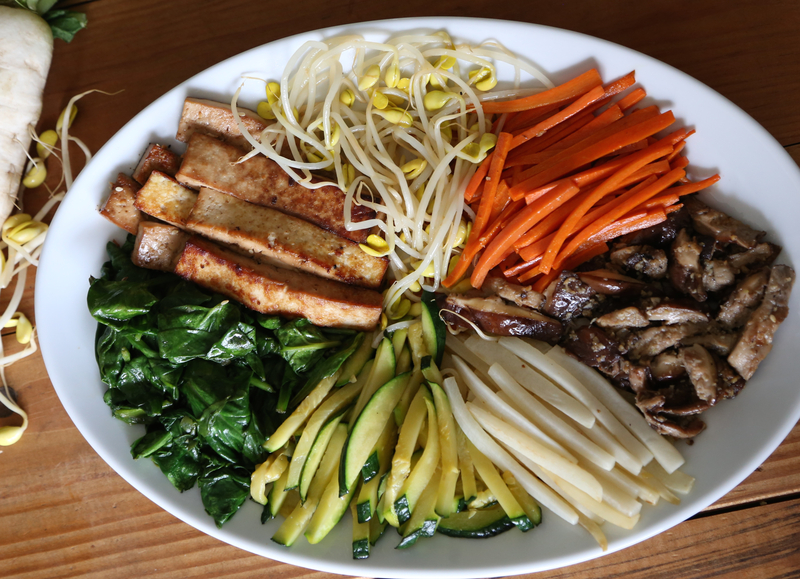 Bibimbap is essentially a rainbow of vegetables, protein (meat or tofu) and a dollop of gochujang (spicy red pepper paste) placed on top of a well-made bed of rice. 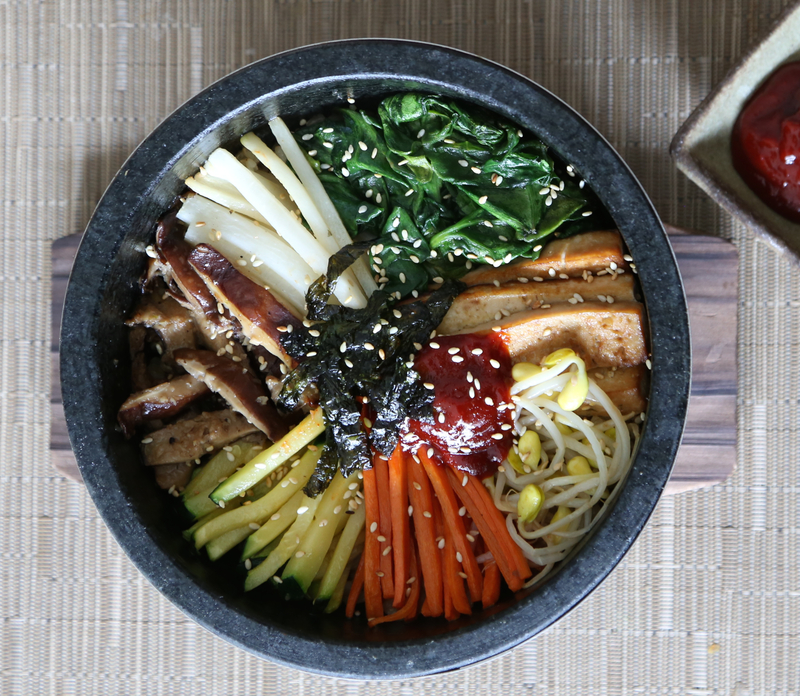 When served in a heated dolsot, a stone bowl, you get crackling rice and a delicious bowl of dolsot bibimbap. Yum! I think the best kind of bibimbap is dolsot bibimbap. However, although a dolsot certainly makes this dish more interesting to eat, you don’t have to have one to prepare bibmbap. You can simply place all ingredients in a regular bowl. Update: another option is a cast iron skillet (see Emily’s post at Nourishing Matters). Simple and versatile to make, a variety of vegetables can be used according taste preferences. Keep in mind that what makes this dish so beautiful is the array of colors and textures of vegetables used. Rinse and cook rice according to package directions. Rinse and drain tofu. Cut into 1/2-inch thick slices and marinate for at least 20 minutes and up to a few hours. Heat olive oil in a pan and fry tofu, turning once, until golden. Set aside. Stir-fry the carrots in a little olive oil, garlic and a pinch of salt and pepper. Transfer to a plate, set aside and repeat same process with the zucchini, radish and mushrooms. Bring a large pot of water to boil. Blanch spinach leaves just until wilted, about 15 seconds. Remove from pot, drain, place in a bowl and toss with about 1 teaspoon sesame oil, a little garlic, a dash of sesame seeds and pinch of salt and pepper. Repeat same process with the bean sprouts. Put about 1-2 teaspoons of sesame oil in the base of each stone bowl. Swirl oil (or use a brush) to coat inside of dolsot. Add cooked rice in the bowls and nicely arrange small mounds of tofu and vegetables over the top of rice. Add a teaspoon (or more to taste) of gochujang to the side. Pour 1-3 teaspoons of sesame oil around the inner edge of each bowl. Place the stone bowls on the stove over high heat for approximately 5 minutes, or until you can hear the rice crackling. Carefully remove the hot bowls from heat. Garnish with roasted sesame seeds and roasted seaweed and serve. Please note the dolsots will be very hot, so be sure to protect your hands and the table (with a trivet). Before eating, mix well with a large spoon. Each diner can add more sesame oil or gochujang to taste. Martine’s Notes: For those of you who enjoy spicy foods, another option for cooking the tofu for your bibimbap is trying Tofu in Spicy Garlic Sauce, instead of marinating the tofu in the sauce posted above. As mentioned above, you do not need a dolsot to make bibimbap. For making bibimbap in a regular bowl, I’d recommend warming all ingredients before placing them in the bowl. Traditionally dolsot bibimbap is topped with a carefully placed raw egg in the center of the bowl. The heat from the stone bowl cooks the egg. Some prefer to fry the egg in advance or, like me, you can choose to leave it out all together. If making regular bibimbap (without the dolsot) and you include an egg, first fry the egg separately, before adding it to your bowl of bibimbap. Here’s a photo with a pre-cooked egg and one with a raw egg on top. I’ve made several versions of dolsot bibimbap using different types of rice (brown, red, black, and even green pea rice!). All were delicious. My husband loved the added texture of the peas when I made it with my green pea rice. Again this dish is so easy and fun to make. Be creative and enjoy making it your own! Dolsots and gochujang can be purchased at a Korean grocery store, or you can purchase them online. I bought my granite dolsots through Amazon here. They came with little wooden trivets to protect the table from hot bowl. Please note I am not affiliated with Amazon or the seller in any way. My dolsots arrived the color of a light grey stone (view the Amazon link). I had to first season them—a process that took several hours—before use and then they turned very dark, almost black, as seen in the photographs above. Finally, if you can tolerate the “heat”, gochujang is a MUST. The taste is so delicious and unique, no other hot sauce will do. Gochujang really brings this dish together in a spicy and flavorful way. However, if you and/or those you cook for don’t like or have difficulties tolerating spicy foods, you can omit the gochujang and use soy sauce and sesame oil as seasoning sauce instead. It won’t be exactly the same, but will still be delicious. Yes, dolsot bibimbap was a staple for me as well! I always found it funny that Chuncheon was considered “the country” yet it had a population of over one million! I suppose in comparison to Seoul’s 10 million+ population, it was! I also loved Japchae/Chapchae. I’ll be posting a recipe for that soon! That looks absolutely amazing. What a great creation and how lucky you were to live in South Korea for a while! Thanks Amanda. Yes, I was lucky indeed. A great experience I will treasure always! Oh yes. I love bibimbap so much, and this looks gorgeous. We always had kimchi served with ours. I don’t suppose you learned how to make that while you were there? Thank you! So glad you like it! In Korea I had bibimbap with kimchi too. Unfortunately I didn’t learn how to make it, but I’ll ask some Korean friends. If one day I try to make it, I’ll be sure to share the recipe and my results! This looks so wonderful. I absolutely love Korean food. What a fabulous presentation and recipe. Thanks! I know what you mean, I really like Korean food too. I’ll be posting a recipe for Korean noodles, Japchae/Chapchae, soon! Hi Manny, thank you for following. I’m glad you like this post. All the best with your new blog! Martine! That looks delicious!!! Yummy, yummy, yummy! Hi Yoomi, thanks! That means a lot coming from you. I know you KNOW and LOVE good bibimbap! I wish I could have shared some with you! Beautiful dolsot bibimbap, especially with all those colors. One of my all time favorite dishes. I hope to visit South Korea someday, see the rumblings of Seoul, and taste all the food the country has to offer. I should really buy a dolsot… I love this dish. Your versions are all beautiful! Thank you so much for sharing your recipe! Bibimbap is one of my favorite dishes, too! I love all of the veggies. I made a version of it on my blog, referencing your recipe since that’s what I used as a resource. Thanks again for the inspiration! Hi Emily, you are so welcome! Thank you for your kind note. I’m happy my post helped provide inspiration for you to make bibimbap! Yours looks fantastic, vibrant and delicious! Great idea to make it in a cast iron skillet!!! I’ll update my post to provide a link to yours so my readers can see the possibility of using a skillet. I’m having guests over this weekend and I was thinking I should serve bibimbap! Now, I will! Thanks also for the reference. Have a great day!